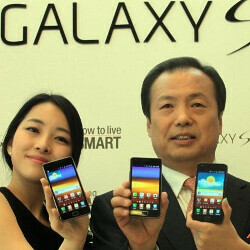 It’s only been a month since the Samsung Galaxy S II has rolled out in South Korea at the end of April, but sales of the company’s newest flagship have already reached one million units. At such a rate, the Galaxy S II is well on track on doubling the sales of the super successful first Galaxy S, which sold over one million units only 70 days after it had hit shelves. It took three days for the next-gen Galaxy S to reach 100,000 sold units, eight to double the number to 200,000 and nearly two weeks for half a million. That’s way over iPhone sales in the Asian country, but we should mention that the Apple-made handset was exclusive to only one carrier in the country. So while the phone is not yet available stateside, it’s already getting rolled out across different European markets, so the sales number might well continue to surprise us. The Galaxy S II brings state-of-the-art hardware with one of the slimmest bodies, a 4.3-inch Super Amoled Plus screen and lightning-fast 1.2GHz dual-core chip. The downside? We find it hard to pinpoint anything major except for the price, but to get a better understanding of all its features, feel free to check out our in-depth review of the Galaxy S II. when will it come to the US of A? It's been over a month!!! Well congratulations to Samsung for reaching over 1 million sold in Korea, but they could be selling much, much more then that if they would go ahead and release this device in the U.S. already! I mean seriously! The U.S. has way more cell phone users then Korea, so for every day they delay this device that is that many more customers they are losing to people purchasing other devices and that means less chances of Samsung reaching their sales goals. I'm not sure who is in charge of this ridiculous delay, but last time I heard they have already been authorized the go ahead from the FCC, so what is the hold up??????? They must like losing money. Samsung or the U.S. carriers are going to wait too long to release this phone in the in the states and there will be another phone with the same specs or better that will be released at the same time or before the Galaxy S2 that will steal sales from Samsung. Also because of it's slow rollout on Android updates recently in the US, people cant help but look at HTC. Honestly, the do such a better job at keeping US customers happy.